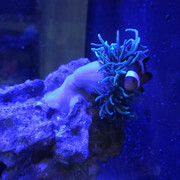 I've had my bubble tip anemone for several months. My tank is close to two years old. Nitrates and ammonia is undetectable, salinity is 1.026, temperature is 78, pH is 8.2. 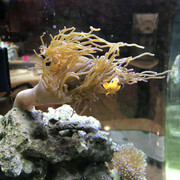 This anemone looked so amazing, huge magnificent! I couldn't believe how well it was doing. Then, about 3 days ago I noticed it wasn't perking up as big when the lights came on...today it looks like a baby version of its former self. The only thing I've done differently is I did start feeding a few myssis shrimp maybe 1-2x per week. It also started to move around a few weeks ago, looking for new spots (which I'm assuming means it wasn't happy). What do I do? Do I feed it some miss shrimp? I have an identical problem, same nem, same time, and even worse, a couple of days ago it shrunk to a golf ball and came off the rock. Even worse, I replaced it last week, and the new one is doing same. Now sometimes, they will just shrink up for a few days, then return to normal. They don't need regular feedings so for now, let him be. I hate to say it man but this forum feels deader than dead. I’d imagine on some saltwater aquarium forum on Facebook I’d have dozens of responses by now. Hi there! Your parameters look good. I would not feed it for now until it opens up more. As long as he is still attached to a rock, and his mouth is not gaping I would just keep a eye on him. 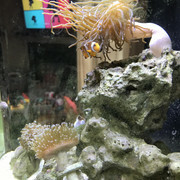 I have several RBT and a S. Haddoni. The RBT nems every now and then have shrunk up on me, but they would be back to normal in a few days. 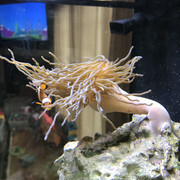 I only feed my nems Mysis every few weeks. I don't keep clowns though. Just a thought.....do you think your clown is irritating the nem? 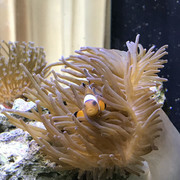 Clowns can be hard on nems. I’m having same issue with mine and we’ve got something in common. I fed mine my sis shrimp as well; and now it went to hide in the back and looks just like yours. Maybe they got annoyed? Give it more time, maybe it wants to split. A few days after this post it returned to its former glory and is bigger and more robust than ever. What a strange thing. I was starting to worry he was a goner. 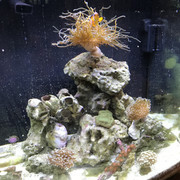 I’ve added weekly music shrimp feedings. Once a week. Seems to like it. Yeah. He’s bigger than ever. Looks awsome. Yea! Good to hear!!! Do you have any pics? It’s early morning, lights went on an hour ago...so in a few hours he is even bigger. But doing great as you can see. Last edited by Johny123; 08/30/2018 at 05:20 AM.